‘Make America Great Again’ Billboard Sparks Controversy in Miss. At first glance, the "Make America Great Billboard" on Highway 80 in Pearl, Miss., right outside of Jackson, looks as if it was bought and paid for by the Klansmen and/or Fraternal Order of Police that endorsed President-elect Donald Trump. WJTV.com reports that the billboard was paid for by For Freedoms, "the first artist-run super PAC," which believes "it's time for artists to become more involved in the political process." The billboard shows the iconic image of the Rev. Hosea Williams of the Southern Christian Leadership Conference and Rep. John Lewis (D-Ga.), who was then chairman of the Student Nonviolent Coordinating Committee, trying to lead freedom fighters across the Edmund Pettus Bridge in Selma, Ala. They were all stopped by Alabama state troopers. The incident, which became known as "Bloody Sunday," took place on March 7, 1965. It was a demonstration for voting rights, but also a call for justice for Jimmie Lee Jackson, 26, who was shot and killed by Alabama State Trooper James Fowler. For many young activists of this generation, Jackson's murder was to the civil rights movement what Michael Brown Jr.'s state-sanctioned execution was for the Ferguson, Mo., uprising. In the end, after Sheriff Jim Clark deputized random white men to join in violently halting the march, there were many people injured by billy clubs and tear gas. Civil rights leader Amelia Boynton Robinson was among those critically wounded. The Voting Rights Act of 1965 would go into effect later that year. As one might imagine, Selma is a sacred place for many black people in the United States, and this is sacred imagery. The immediate assumption by many people was that white supremacists were responsible for the billboard, but based on the content of the For Freedoms website, that doesn't appear to be the case. We believe that artists, and art, play an important role in galvanizing our society to do better. We are frustrated with a system in which money, divisiveness, and a general lack of truth-telling have stifled complex conversation. A quick tour of its website shows an image of a black man standing behind a torn Confederate battle flag; another image that seems to be a nod to gender fluidity and transgender identity; signage that pushes society to free itself of patriarchy, fear and student debt; and an image showing how white supremacist state violence targets black people. 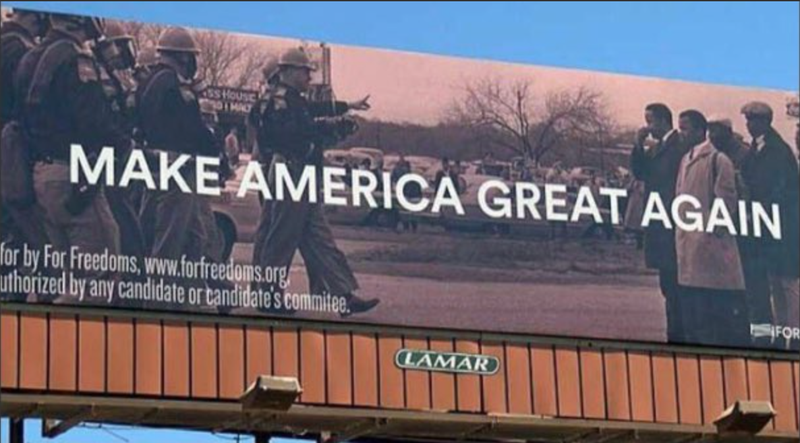 Here's the thing: For Freedoms' "Make America Great Again" billboard seems more triggering for black people than a wake-up call for white people. If being subversive is the point, it's a fail for me; instead, it feels unnecessarily violent and exploitative—a reminder of the apartheid state that black people in this country, especially in the Deep South, have never quite been able to escape. The 2010 census report showed that Pearl was 81.18 percent white, 16.24 percent black and 2.3 percent Latinx. According to the latest data, Pearl is now 69.3 percent white, 22.6 percent black and 5.9 percent Latinx. Trump won by a landslide over Hillary Clinton in Pearl, which is in Rankin County: 75.2 percent to Clinton's 22.4 percent. This billboard probably brings joy to racist white people—most definitely not awareness. It may cause the more deceptive among them discomfort, which is a good thing. Still, I can't think of any socially conscious organization that would want to subject black people in the South to this imagery as they try to carry on with their daily lives. "When I initially heard about the billboard, my immediate reaction was one of shock that someone would have the audacity to do something like that," said Brianna Thompson, 33, a program coordinator in Jackson, Miss. "To take a civil rights event of that magnitude and combine it with that statement is an insult. To do it in a red state? Even worse. "It definitely wasn't the smartest approach," Thompson added. "There are different ways to generate conversation in Mississippi." There are, however, some black people I've engaged on this subject who see the billboard as a sign of resistance. According to WJTV.com, Mississippi Gov. Phil Bryant called the billboard "reprehensible." “It’s disappointing that this group would use this image as an attempt to divide the country,” said Bryant. Pearl Mayor Brad Rogers said that the billboard was not "vulgar"; nor did it violate any laws or ordinances. Thus, it's protected free speech. According to Hank Willis Thomas, co-founder of For Freedoms, the billboard has been up since October and is scheduled to come down next Wednesday. In an interview with the New York Daily News, Thomas said that the point of the billboard was to "start a dialogue about issues such as voter suppression" and that "part of the artistic purpose of the work was to challenge and ask questions about politicians' use of empty slogans." This is an admirable and necessary endeavor, but it missed the mark here.